The Buckeye State is, not surprisingly, home to the Ohio Buckeye. 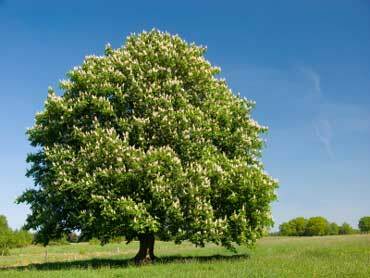 This species of tree, which Ohio has adopted as its state tree, contains over 13 varieties of Buckeye also known as horse chestnuts. It is a medium-sized deciduous tree, reaching between 50 and 80 feet tall. The compound leaves of the Ohio Buckeye usually contain five long leaflets. The fruit of the Ohio Buckeye contains tannic acid, and is poisonous to both cattle and humans; however, the acid if removed can be used to tan leather. Though the Ohio Buckeye may not be the best fit for every Ohio yard, Ohioan growers can choose from one of several other tree varieties when planting. Ideal for bearing fruit, disease and drought resistance, and temperature adaptability. Ideal for providing privacy, fast-growing properties, and easy care. New developments throughout the United States mean more infrastructure, more people, and more invasion of privacy. The residents of Ohio have the option to plant and tend trees that produce privacy, turning away prying eyes and loud noises and instead enjoying the quiet and peace of private property. The Leyland Cypress is the perfect privacy tree for Ohioan inhabitants. The Leyland Cypress grows quickly, adds distinct charm, and produces thick barriers between a private abode and unwanted chatter. Growing between 3 and 5 feet a year, the Leyland Cypress will give the Ohioan yard the fast-growing privacy for which they have been searching. Alternatively, the Thuja Green Giant and American Holly will bring privacy, color, and solitude to the savvy planter’s yard. Most of Ohio falls into a humid continental climate, with the exception of the Bluegrass regions in the south. Summers are hot and humid, with the record from July 1934 at 113°F. Winters are cool to cold, with the record from February 1899 at -39°F. Snowfall and rainfall is moderate, falling throughout the year. Most trees require well-drained soil rich with minerals to grow. 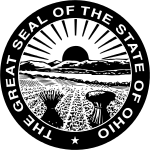 Miamian soil covers over 750,000 acres of Ohio’s land. A productive, loamy, and well-draining soil, Miamian soil is high in lime content and grows deciduous forests. Today, farmers use Miamian soils to grow soybean, corn, and winter wheat. Regardless of the property’s location in The Buckeye State, a soon-to-be tree planter can perform a simple test to determine his/her soil type. Rainfall is moderate, falling relatively consistently throughout the year. 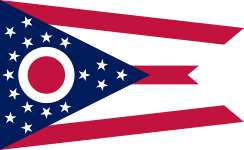 Ohio receives, on average, 56 inches of rainfall annually. Precipitation falls in lateral bands across the state, with the most rain falling in southern regions. In the far northwest, precipitation is smallest, often receiving less than 36 inches. Snow follows similar patterns, although the northwest and northeast regions switch. In the Lake, Ashtabula, Geauga, and Cuyahoga regions, snowfall is much heavier, sometimes exceeding 100 inches. The rest of the state sees anywhere from 40 inches or less. With moderate and inconsistent rainfall throughout the state, Ohio planters should investigate irrigation systems for the property. Irrigation systems can help ensure successful plant growth, as newly planted trees require consistent and controlled access to water for strong growth in the first seasons. The roots and limbs are affected negatively by transplantation, and the stress can be minimized by providing sufficient water access. Drip or sprinkler irrigation systems can be an effective method for ensuring successful plant growth. Ohio is home to four unique growing zones. A growing zone simply refers to the USDA’s determination of areas where certain plants are most likely to thrive, preferring to focus on minimal temperature ranges in which a plant can survive. Most of the state, extending east from the northwestern border, falls into zone 5b, with low temperature ranges between -10°F and -15°F. This zone extends south, towards Route 35, and east, towards Wheeling. The southern portions of the state and the southeastern border, traveling inwards to just west of Columbus and north to East Palestine fall into zone 6a, with temperatures in the range between -5°F and -10°F. In the most southern regions, low temperature ranges are warmest, and rarely fall below -5°F. In the northeastern portions of the state, near the border with Lake Erie, temperatures are coolest, and the low temperature range is between -20°F and -15°F. Tornadoes and earthquakes are the most common natural disasters to hit Ohio. Tornadoes, although occurring annually, are usually minor and do not cause significant damage. Similarly, earthquakes do not cause much damage, nor do they register above 5.0 usually; however, between 2002 and 2007, more than 30 earthquakes have struck Ohio. Soon-to-be tree planters should not be concerned about newly planted trees being affected by serious weather. Trees can be beneficial in preventing erosion and cooling hot summer temperatures. If you prefer to purchase your trees or shrubs in person instead of online, we offer this comprehensive guide to purchasing a tree at your local Iowa nursery or garden center. However, since we don’t actually live in Iowa we can’t guarantee this list to be 100% accurate – but we did attempt to be as accurate as we possibly could. We have no affiliation with any of the businesses listed below and make no guarantees as to the businesses’ ability or the quality of trees you will receive. As with any purchase you make, be sure to check out the business with the Better Business Bureau, references, and any other sources you may have.